Homemade acne face masks are very effective at helping to treat and prevent acne outbreaks. The best face masks for acne contain natural ingredients that help to kill off bacteria that cause pimples. They also help to dry up excess oil and unclog pores from dead skin cells. DIY acne face masks are also very easy and cheap to make and they usually contain a few simple ingredients that you probably already have in your home. Natural acne face masks are also great at helping to prevent acne scars from forming. Acne is caused when excess sebum (the oil that the skin produces to protect it and keep it moist) and dead skin cells plug the skin’s pores. When bacteria infect the blocked pores, the result is inflammation which causes red, pus-filled bumps to form on the skin. Depending on the severity of acne, the infection can cause pimples, pustules, and papules to form. Severe acne can cause large inflamed lumps called nodules or acne cysts to form. This happens when the bacteria spreads deep into the skin’s layers. It may not be possible to get rid of pimples in a day, but homemade acne face masks will help you get rid of acne much quicker. Many acne remedies contain natural antibacterial ingredients like honey, tea tree oil, and aloe vera to kill off acne-causing germs on the skin. You can also remove dead skin cells and excess sebum from pores by using baking soda or oatmeal as an ingredient in your natural face mask for acne. First of all, let’s look at the different natural ingredients that you can use to make your own DIY acne face mask at home and help clear up bad skin quickly. All of these ingredients are backed up by scientific research for their effectiveness as antibacterial and cleansing agents to help cure acne naturally. When looking for the best kind of natural ingredients to include in homemade face masks for acne, it’s important they are antimicrobial to kill off any infection in the pores. You also need anti-inflammatory components in the face mask that help to reduce redness, inflammation, and swelling. To prevent further outbreaks of acne, it’s important to gently exfoliate impurities from the pores. Tea tree oil is one of the best ingredients to use in homemade acne face masks. The antimicrobial properties of tea tree oil can quickly and effectively kill many strains of bacteria that infect the skin. Tea tree oil also helps to reduce swelling and redness in inflamed pimples and dries up excess oil from the pores. Lavender oil is another essential oil to use as an acne remedy and is a highly-effective compound in natural acne face masks due to its antibacterial activity. In fact, the calming effect of lavender oil will not only help reduce stress, but it will calm inflammation in swollen, red acne bumps. You may think that honey is too sticky to help in treating acne. However, honey contains powerful antibacterial properties that make it an excellent ingredient to include in homemade face masks for acne. The soothing effect of aloe vera on inflamed skin and its antibacterial compounds means that aloe vera gel is another natural ingredient to use when making your own acne face masks. 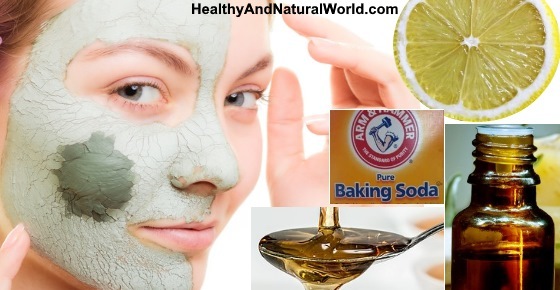 Baking soda can be used in homemade acne face masks due to its antibacterial activity. The grainy texture of baking soda (sodium bicarbonate) also means that it’s an excellent way to gently exfoliate your skin to dry up excess sebum and unclog dead skin cells from pores. When making your own acne face mask, use raw unprocessed apple cider vinegar to help disinfect pores and get rid of acne-causing germs. Also, the low pH level of apple cider vinegar helps to reduce skin inflammation. Even a simple natural ingredient like green tea that has medicinal properties can be added to natural face masks for treating acne. The astringent effect of green tea on the skin helps to dry excess sebum from pores. Green tea is also a rich source of antioxidants that can help to destroy free radicals from the skin to keep it healthy. The journal Hippokratia found that green tea contains compounds that help to reduce the skin’s production of sebum.9 It is an effective anti-acne treatment when used together with other acne-fighting natural ingredients. The antibacterial and anti-inflammatory properties of cinnamon mean that it is useful in face masks to treat outbreaks of acne. Oatmeal can be added to natural homemade acne face masks because of its ability to cleanse the skin from acne-causing germs, provide a protective moisturizing barrier on the skin, and gently remove dead skin cells from blocked up pores. Clay is naturally occurring earthy substance that has the ability to absorb impurities from the body. There are several types of clay such as Fuller’s earth (like this one), green clay, white clay (kaolin) and bentonite clay (like this one). You can read more about them in my article on how to use clay for body detox and great skin. Green clay, for example, is loaded with iron and magnesium which gives it its green color. It acts fast to absorb oils and toxins, and is suitable for controlling oily skin. Witch hazel is also an effective remedy to help reduce the infection and inflammation that is associated with acne. Witch hazel is extracted from the bark and leaves of the Hamamelis Virginiana. This plant has been used for centuries as a remedy for many skin problems. Because of its amazing healing properties, witch hazel extract is also found in many skincare products that are on the market today. You can easily make your own facial masks to treat acne and prevent outbreaks of pimples when used as part of your regular skin care routine. Use them also to help lessen the severity of acne outbreaks and help you get clear skin free of blemishes. To help get rid of acne quicker, make a face mask by adding together raw unprocessed apple cider vinegar, green tea, some sugar, and honey. The apple cider vinegar and green tea help to reduce sebum, the honey kills bacteria and the sugar removes dead skin cells. These ingredients will help your skin to look great and pimple-free. Add 1 tsp. raw apple cider vinegar, 2 tsp. green tea (wait until the liquid has cooled), 5 tsp. sugar, and 1 tsp. honey to a bowl and mix well. Use your fingers to gently massage the facial scrub on your face to unclog pores. Leave for 10 minutes and rinse with warm water. You can help keep your acne-prone skin free of blemishes by using the apple cider vinegar skin toner to cleanse your face in the morning and evening. Make a quick and easy honey facial mask to soothe inflammation on your skin and help reduce the bacteria that cause acne. This face mask uses tea tree oil to boost the antibacterial effect of honey and some jojoba oil to nourish your skin. Mix 1 tbsp. honey and 1 tbsp. jojoba oil in a glass bowl. Add 3 drops tea tree oil (or 2 drops tea tree oil and 1 drop lavender oil). Apply the honey remedy to your face and leave it on for 20 minutes. Use the anti-acne honey face mask once a week to help prevent acne outbreaks and to keep your skin well-moisturized. You can find more fantastic honey face masks in my article: The Top 10 Honey Face Masks – for All Skin Types. Make your own cinnamon acne face mask to quickly reduce inflammation around red bumps on your face and kill off harmful bacteria from your skin. The antibacterial compounds of honey are boosted by cinnamon in this simple homemade remedy to stop bacteria from spreading. Mix 2 tbsp. honey with 1 tsp. cinnamon to form a soft paste. Leave for 15-20 minutes before rinsing off. Apply the cinnamon mask 1-2 times a week to help to reduce the number of pimples by cleansing acne-causing bacteria from your skin. Baking soda can be used both as an effective natural face mask for acne and as a facial scrub to dry up excess oil and unblock dead skin from your pores. The baking soda homemade recipe is very easy to make with just some water and a little lemon juice to help dissolve dead skin cells. Mix 2 tbsp. baking soda with 2 tbsp. water and add 1 tsp. lemon juice. Apply the baking soda paste to the acne-affected areas on your face. Leave for 10-15 minutes to allow the baking soda to break down the bacteria. Because baking soda has a high pH level, you should only use this acne face mask once a week at the most and always use a good natural moisturizer after. To make an exfoliating acne scrub with baking soda you can use the above recipe, but just leave out the lemon juice. To remove dead skin cells and unclog pores from excess sebum, massage the baking soda remedy onto your face. Rinse with warm water and pat dry. For more information on how baking soda can be used as a natural acne treatment, please read my complete guide to baking soda for getting rid of bad skin and pimples. Ground oatmeal is another way to heal infected, pus-filled pimples that are red and inflamed. The cleansing effect of oatmeal helps to clear away germs from your skin and its silky texture leaves your skin feeling smooth and wonderful. Mix together 2 tbsp. ground oatmeal with 1 tbsp. baking soda. Add enough water to make a thick paste. Gently massage the oatmeal remedy to the affected area and leave to dry. Rinse with warm water to remove the oatmeal acne mask. Apply cold water to your face to close the pores. Use 2-3 times a week to help your skin to heal quicker from the effects of acne lesions and to prevent further outbreaks of whiteheads, blackheads, and pustules. To make an oatmeal facial mask for acne with honey, lemon juice, and tea tree oil, please read my article about the many natural remedies to effectively deal with oily skin problems. Get rid of acne quickly by regularly using a face mask from aloe vera. This great homemade acne mask is very easy to make and uses tea tree oil to boost the antibacterial activities, while at the same time aloe vera reduces inflammation and redness. The aloe vera mask will also help to get rid of acne scars. Add 6-8 drops of tea tree oil to 1 tbsp. aloe vera. Apply the acne treatment to your pimples and leave for 30 minutes. Rinse with warm water and pat your skin dry. You can use this aloe vera homemade mask daily to reduce the severity of acne. It is also a good face mask to use 1-2 times a week to help prevent any pimples from appearing on your face. Make your own face mask to remove pimples by combining powerful bacteria-killing tea tree oil with egg whites and lemon juice. This DIY face mask is a great way to reduce excess oil from your skin and help treat acne naturally. The combination of lemon juice egg white works on 2 levels to fight acne. First of all, egg whites help to draw oil out of your pores and secondly, lemon juice helps to get rid of dead skin cells that clog pores. Whisk 2 egg whites until they form stiff peaks. Add 2-3 drops of tea tree oil and the juice of half a lemon. Mix in gently to the egg whites. Apply the acne mask to your face and leave to dry. For best results, use the tea tree oil and egg white mask 2-3 times a week to help clear pimples and keep your skin blemish-free. Clay is fantastic for your skin. Bentonite clay, for example, has properties that help to draw out impurities from the skin. It is also great for acne because it has antibacterial properties. You can also use green clay which is good for oily skin, or white clay (also called kaolin) which is very gentle and suitable for sensitive skin. Mix 1 tsp. raw organic honey, 1 tsp. bentonite clay (or other type of clay) and enough water to make a paste. Mix a small amount of clay, such as bentonite, white, or green clay with some jojoba oil and make a paste. The best way to use witch hazel for acne is either as a skin toner or a skin mask. To use witch hazel as a skin toner, you can either apply it with a cotton pad to the affected area up to 3 times a day, or you can keep it in a spray bottle and spray directly onto your skin. Mix the ingredients in a container or spray bottle. Mist the affected area or apply it using a cotton ball. You can find more witch hazel skin applications in my article: Witch Hazel for Acne – The Ultimate Guide. 3. Coconut Oil For Acne – Does It Really Work?